Today's batch contains the fourth DVD set for Diabolik Lovers anime with a bunch of Subaru-themed bonus items (and a bromide of Laito covered in blood). Subaru's version of Gin No Bara is included on the second soundtrack inside the DVD case and it's yet another lovely version of the song. I'm not a big Subaru fan, but every version of Gin No Bara has been amazing and his is a worthy addition to the set. 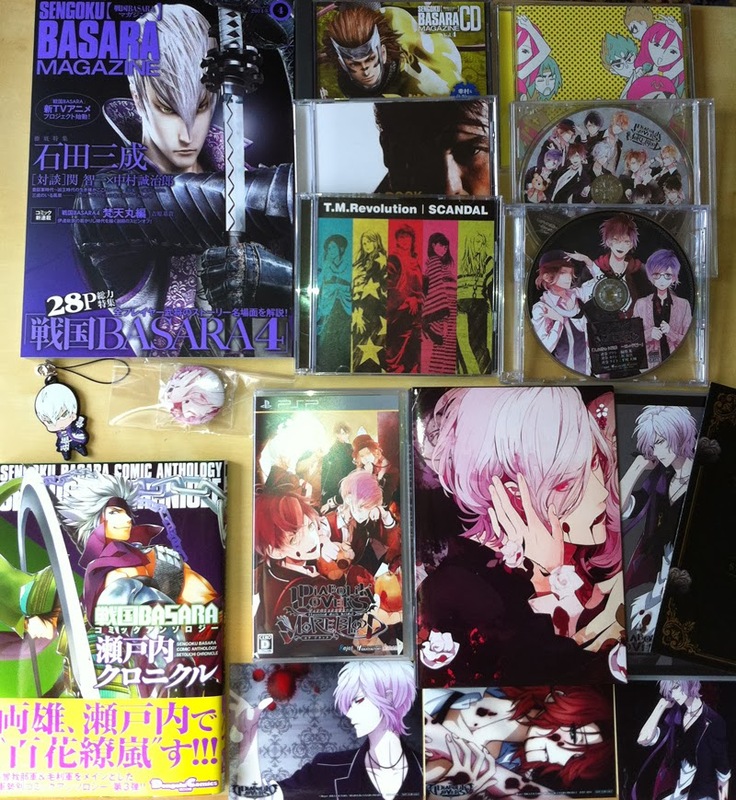 The DVD is complemented by the PSP version of Diabolik Lovers, More Blood, which arrived on the same day. I managed to buy one of the store-exclusive sets (Imagine still had a few in stock!) so I received all three bonus CDs; the two I really wanted with Laito, and a second copy of Odessa No Noroi ~Oitsumerareshi Vampire-tachi~. If anyone wants to provide a home for my spare copy please let me know. The other CDs are Kikkawa Koji's Samurai Rock (used in the Gifuu Doudou!! Kanetsugu To Keiji anime), the Hyadain/Yoshiki Risa collaboration Shift To Jikyuu To, Tsuide Ni Ai Wo Torimodose!! (from DD Hokuto No Ken) and the Sengoku Basara 4 EP split single with the game's opening and ending theme songs. I liked Count ZERO from the start but I have to say that SCANDAL's Runners high has really grown on me too after playing the game. Moving on to the books, I received the Sengoku Basara Comic Anthology 'Setouchi Chronicle' manga and the fourth issue of Sengoku Basara Magazine along with the Mame Sengoku Basara Mitsunari strap and Sasuke/Yukimura talk CD. I'll try to get a review/summary of the magazine up tonight or tomorrow, depending on how much free time I have. I can confirm for now that there isn't much in the way of new information in the magazine for game or anime fans, sadly! Nice stuff! Got my SB4 EP single and SB4 OST just yesterday along with the Special-A Strider Hiryu Limited Edition. Good stuff (dat TMR/SCANDAL special from DVD - ^___^) though I'm kinda scared of myself now (while I own most of the OSTs and compilation albums I was literally forcing myself from buying BASARA singles for quite a long time and now I'm afraid I'll go berserk of buying every single one of it, lol). I planned for most of the books to ship together at the end of the March though so it's finally time to relax a little for me on imports, haha. I picked... THE WRONG MAGAZINE SEEMS! OMG DAMMIT SHOULD HAVE PICKED THE GAKUEN 7 INSTEAD!